• 2 single bed and 1 bunk bed. This room is very bright. It is only a few steps below ground level, when coming in from the front of the building, but from the rear of the building you get straight to the road. In the summer it is very cool. This air-conditioned room with a 32″ LED TV, fridge, a small kitchenette, electric kettle, iron and hairdryer. 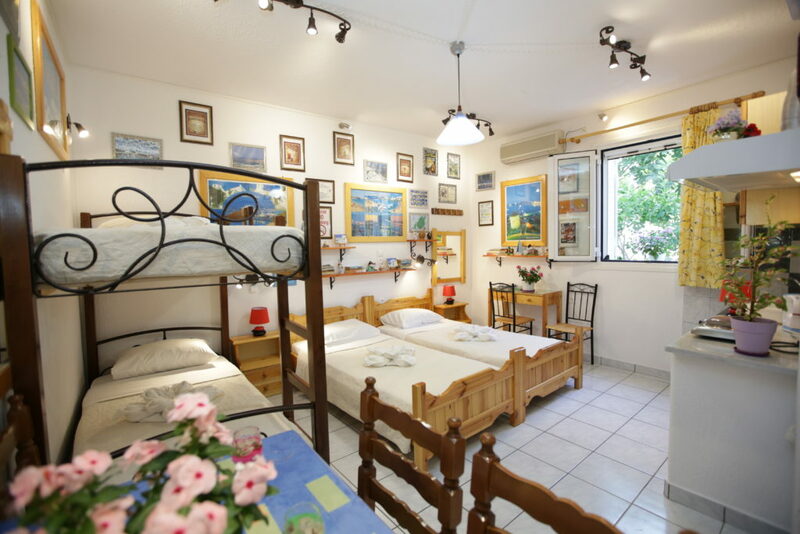 The room opens to a small patio that leads to a lemon-tree garden with seating area, where can you sit and enjoy your coffee and drink, in a quiet neighborhood, but very close that you need with your feet, 200m,from sandy beach Livadia. Please not that this room type cannot accommodate a baby cot. Free street parking is available nearby.